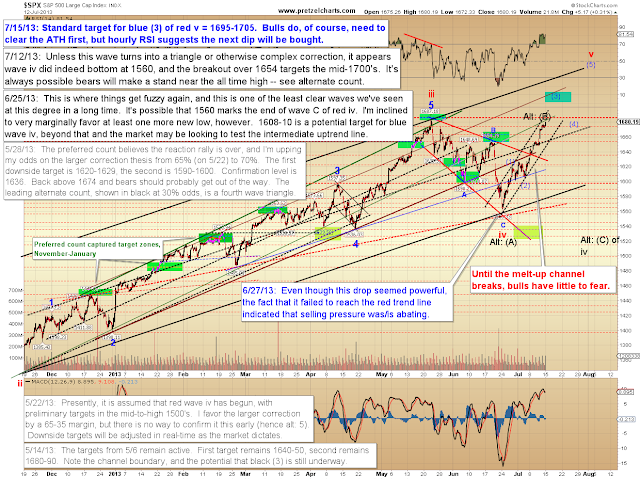 Pretzel Logic's Market Charts and Analysis: Are We Witnessing a Blow-Off Top? Are We Witnessing a Blow-Off Top? Today we'll revisit the long-term wave counts in two markets, both of which suggest this may be the final wave of the rally. A blow-off top in progress. Last update I discussed the bull case. Today is not a reversal of that argument by any means, it's simply a discussion that encompasses a larger time frame. 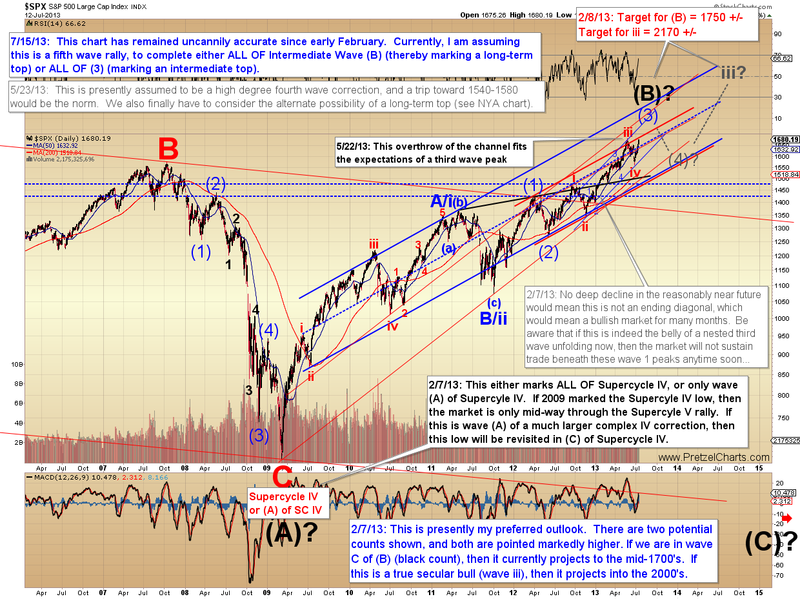 Near-term, I feel bulls have better odds, and the next target zone for the S&P 500 (SPX) exceeds the all-time-high. But in the bigger picture, the party may be coming to a close in the not-too-distant future. First up is the S&P 500 (SPX). When I drew the initial projections for this chart back in early February, I obviously couldn't know it would follow that projection almost turn-for-turn for the next five straight months. If only I could have held my nose and bought the dips exactly as anticipated. This is such a hard environment from which to unplug one's brain, though, with the ongoing Central Bank machinations. But from a purely technical standpoint, the first read is usually the right one. In any case, it appears reasonably likely that February's projection of 1750 +/- will come very close to being reached. It also appears this is a fifth wave rally -- which means its job is to get us to believe it will never end. 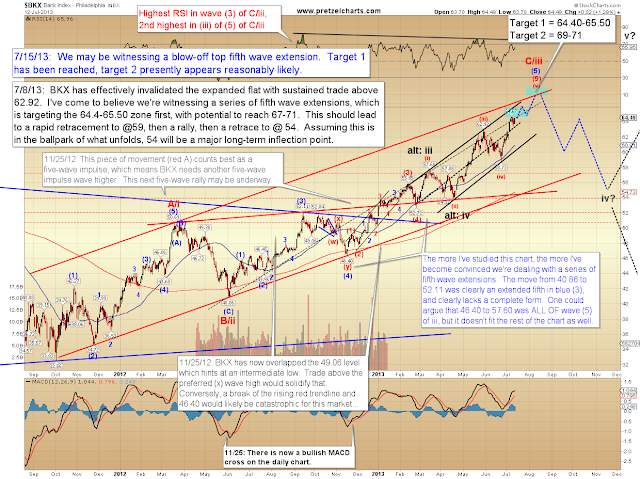 Fifth waves are where smart money passes the bag to dumb money, just before a move finishes. If one isn't inclined to front-run, there should be some warning in the form of an impulsive wave down, though fifth waves sometimes end abruptly on a strong reversal that leaves heads spinning, so please approach this market with caution. On the chart below (4)? and iii? are gray because we can't know yet whether to expect them or not. Black (B) marks a potentially complete wave: a long-term top which then leads to black (C) way down there at the bottom of the chart. Near-term, the SPX looks to be in the process of completing wave (3) of v. Until the All-Time-High is claimed, bears can hold out hope for a more bearish resolution, but I'm inclined to view the bears as near-term underdogs at this exact moment. If my long-term count is correct, though, their time is coming. 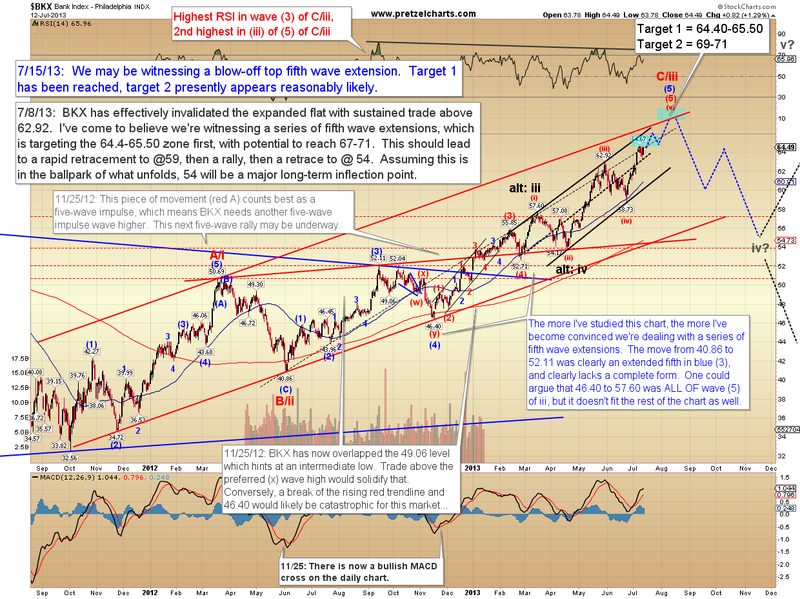 The Philadelphia Bank Index (BKX) has reached the target zone from 7/8, but also appears likely for continued upside. I've become quite convinced we're witnessing an extended fifth wave in this index, and the concept of an extended fifth wave fits the psychology of this time perfectly. It also fits the Fed's influence of printing so much money that the market has no choice but to keep heading up, when it "wanted" to stop rallying some time ago. The fifth wave extension in this case is almost an unnatural move; a wave extension forced into existence by excess liquidity if you will. In conclusion, if the long-term wave counts are correct, the market will continue rallying into the 1700's. And while we don't want to get too far ahead of the market, it appears reasonably likely this is the final rally before the most significant correction we've seen in some time. Trade safe.